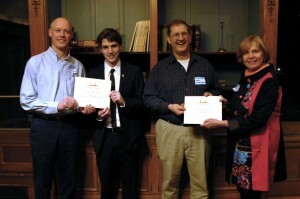 The Award Ceremony for the 2012 Bridge Book Awards took place on April 5, 2012 at Cairnwood Estate in Bryn Athyn. After a wine, cheese and dessert reception, participants and guests settled in to honor the three first place winners. The three first place winners received a certificate as well as a cash prize, and their book proposals will be considered for review for publication by the Swedenborg Foundation editorial board. The Third Annual Bridge Book Awards will open for entries on November 1st, 2012, and closes in February 2013. More information to come on this blog, or www.swedenborg.com. Resubmissions of entries from previous years are allowed and encouraged!